Hello and welcome back to the Art of Business English. In today’s episode I wanted to look at some idioms for presenting. Presenting in English can be a little nerve-wracking, as such, I wanted to help you feel more confident when presenting by providing some useful expressions that will put a smile on your face as you impress those around you with your amazing business English skills. In today’s episode we will be covering the following points. I am often asked what idioms are and quite simply they are expressions. The problem lies in that they are not easily translated because the literal meaning of the individual words is not related to the meaning of the expressions. For example, to be over the moon, means to be excited or ecstatic, however, if we look at the expression and the literal meaning it does not make any sense. So, idioms are groups of words that go together to form expressions, which are understood by native people in specific contexts but are not easily translated or understood if we look at the literal meaning of the individual words that make up the expression. Now that we understand what idioms are, let’s look at some of them that we can use in our presentation to make us feel more confident and show those who are listening to the presentation that we are amazing English speakers. ​Firstly, it is important to note that there are many, many expressions that can be used for presenting. Today, however, I have just selected a few. As I have said in previous episodes, it is important to study a few expressions a week so that you start to use them and memorise them. It is much easier to remember a short list of 5 or 10 expressions, and start to use them, than it is to study a list of 50 idioms and then not remember the meaning of each one, nor use them in your daily discourse. The following idioms can be used to open a presentation and get things rolling. Look at the examples and then the translation. If you’re listening to the podcast, practice the pronunciation of each expression. OK, let’s get the ball rolling. I’d like to kick things off by 11am. Let’s get down to business and start the meeting. Let me dive in to my first point. In my presentation I will be covering 3 points. I would like to go over 3 main areas during my presentation. In my third point I will finish up with a forecast for the next 3 months. The stock price has rocketed, since the discovery of oil. I am not sure how the company will bounce back from the scandal. Sales took off in the third quarter as Christmas shopping started early. The recent plunge in the stock market has wiped out billions of dollars in value. The company has got off to a flying start this year with higher than expected sales. After a good start to the year, sales levelled off. ​In the last part we will look at some idioms for bringing your presentation to a conclusion. Remember, your conclusion should summarise clearly, the ideas mentioned in your presentation. It is customary to take questions at the end of your presentation so be ready to invite the audience to ask any. OK, I’ll just wrap things up with a suggestion for the next quarter. Now, can I clear up any doubts? Thank you for listening, I will now take some questions. So, that wraps up our look at idioms, be sure to review these and work on the correct pronunciation. In the final part of this episode I want to look at how to study idioms. ​Before I leave today I just want to give you some tips on how to study idioms effectively. The first thing you need to do is start with small groups of idioms, I suggest no more than 5 at a time. ​It is very important that we find the translation for idioms as this will help us to understand them. Remember, they cannot be translated literally so, you will need an idioms dictionary or to look them up on the internet on pages such as www.wordreference.com. ​Once you understand the meaning, you need to then try and find examples of them in use. Idioms work best in specific situations and you will need to understand their use in context before you can apply them properly. So, first, create a list of idioms. The list should be on a specific topic area, for example, in this episode, I have looked at idioms for describing trends while presenting. This is more specific and therefore much easier to find idioms for a specific context. Once you have a list of idioms, find the definition and then finally, find some examples of them in use. 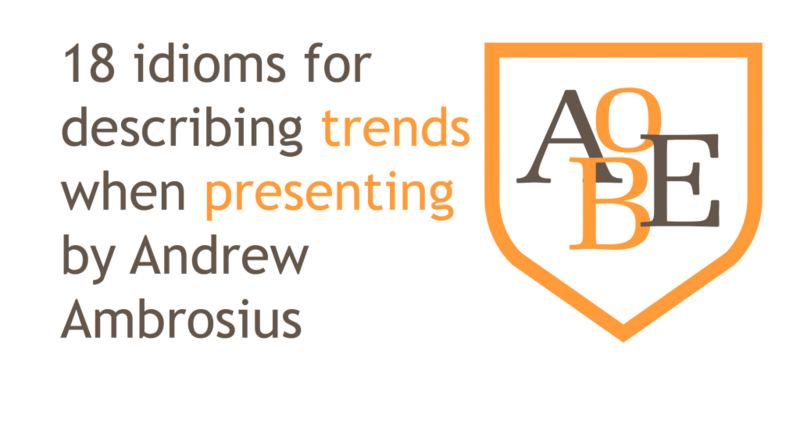 ​So, there you have it, idioms for describing trends while presenting. Be sure to listen to the podcast and practice your pronunciation of the 18 idioms provided in this episode. Start making an idioms list and most importantly, start using them in your daily business activities. As always, it is a pleasure to have you here and we hope you have enjoyed the episode. Please comment over at the AOBE website, or on our Facebook page www.facebook.com/theaobe. If you liked this episode then subscribe to our iTunes podcast and share it with all your friends. Let us know if you have any questions or learning needs. We are here to help. Until next week, take care and have a great day.